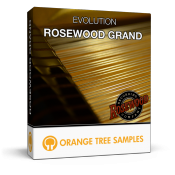 We're pleased to announce the new update for our Evolution Rosewood Grand sample library, an extensively-sampled Yamaha C7 grand piano sample library. The update doubles the audio content in the library, offering two separate mic perspectives. It also has completely re-processed samples for cleaner denoising, adds sostenuto pedal support, and features additional factory presets.